Once again a change in usage has occurred in Regent Street. Once a residential area, it has more recently become shop-bound like its sister, Regent Road. 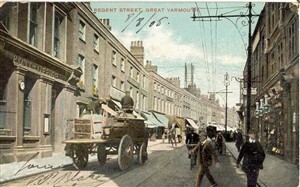 The building on the left of the first postcard was home to the main Post Office for many years until it was closed, being moved to a more central position on the Market Place, firstly in a newsagents on the east side near the Co-op, and soon to be moved to the WH Smith premises on the north side. This page was added by John Layton on 29/05/2007.